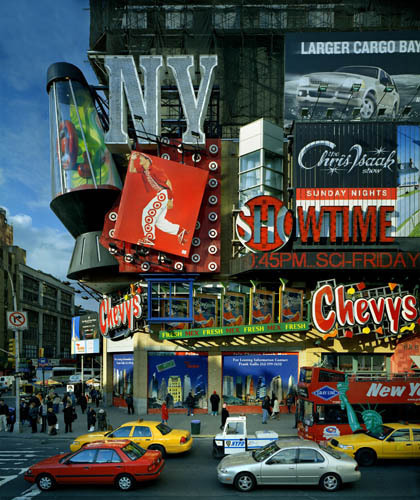 Andrew Moore, Target, 42nd Street, Times Square, NY, 2002, color photograph, 50 x 40". According to a recent study based on images uploaded to Flickr, the Apple Store on Fifth Avenue in New York is now the twenty-eighth-most-photographed place on earth. But even this site of contemporary pilgrimage is easily beaten out as a popular pictorial subject by Times Square. The notorious intersection is apparently still an irresistible draw for those not trying to avoid it at all costs. The appealing shots in this exhibition depict it from a variety of angles and attitudes over the course of the past sixty-odd years, while the midtown epicenter emerges, even in its darker phases, as a consistent locus of energy and a backdrop adaptable to a raft of modes and moods. Andrew Moore’s large, ultrasaturated color print of Forty-second Street’s sign-packed corner and Stephen Shore’s modest volume of lo-fi surveillance-style crowd shots present views—garish and bland, respectively—that will be immediately familiar to the square’s contemporary visitors. Classic vintage takes like Dennis Stock’s portrait of a melancholic James Dean trudging through the rain and Alfred Eisenstadt’s celebratory V-J Day tryst, at the opposite extreme, capture the half-forgotten romance of a previous era. But it is perhaps the more downbeat likes of Lisa Kereszi’s study of a disused and abandoned neon sign and Philip-Lorca diCorcia’s grimy, amusing tableau of stony-faced pedestrians passing a theatrical sign for The Waste Land that will appeal most to those for whom the crossroads of the world is also an all-too-real place in an ever-changing city.